In Lower Pomerania is the Diamond Mountain, which is two miles and a half high, two miles and a half wide, and two miles and a half in depth; every hundred years a little bird comes and sharpens its beak on it, and when the whole mountain is worn away by this, then the first second of eternity will be over. I’ve lived in beautiful old Savannah, Georgia since the 1980s, and being just across the river from South Carolina it was hard not to notice the kerfuffle caused just a few years ago when former SC governor Mark Sanford turned the phrase “hiking the Appalachian Trail” into a euphemism for “having an affair with your Argentine mistress…” (though curiously, “having an affair with your Argentine mistress” has surprisingly not caught on as the euphemism for hiking the Appalachians!). The Appalachians are a curious range of rolling mountains. Lacking the soaring verticality of other worldwide mountain ranges, the Appalachians look to us today like baby mountains. Unlike the Alps or the Himalayas, there is no current tectonic activity there; the Appalachians are inactive. And to be clear, they aren’t just dormant, these mountains are dead. The Appalachians are ancient remnants, and they’ve been decaying for 200 million years. Think of them, if you like, as a parting gift from Africa. Yes, we got the Appalachians thanks to Africa. Mountain ranges are a result of colliding plate tectonics, some today are active and dynamic, others are merely remnants of ones that formerly were. The Appalachians are an example of the latter, a visible leftover from the construction of the super-continent Pangaea, some 300 million years ago, as the African plate collided with the North American plate. Today the Appalachians, stretching from Maine to Georgia, seem a relatively benign, well-rounded sort of mountain range. Such gentle rolling topography speaks to the power of erosion, for three hundred million years ago their jagged still-rising peaks soared six or seven miles high, rivaling today’s Himalayas as some of the mightiest mountains in the history of the world. In their heyday, central Australia’s MacDonnell Ranges would have been a mountaineer’s dream, as high, it’s thought, as any on Earth today. But… after a near-eternity of erosion, the diminished remnants of the MacDonnell Ranges still run in long, jagged wrinkles across the heart of Australia. From the air, they protrude into this ancient landscape like the bony skeleton over which the dry skin of a tired continent is draped. The Rocky Mountains. Miles high, stretching all the way from New Mexico to Canada, you’d think they’ve been here forever. But you’d be wrong. These majestic mountains have come and gone several times. Long before the mountains we see today there were previous mountains that raindrops washed away over hundreds of millions of years; this realization alone illustrates the deep age of the earth. The Rockies of today are only the most recent iteration; the “Ancestral Rockies” eroded into sand grains eons before the peaks of today rose. If the history of the earth were compressed into the span of a single year even these longest-lived mountain ranges of 300 million years would be here and gone in three-and-a-half weeks’ time, roughly the time it would take for a nasty cut on your arm to scab over and disappear. An individual mountain would rise and erode in the span of a few days, a legacy not unlike an acne breakout. Plate tectonics are responsible for all of the earth’s mountain ranges. And over millions of years of growth the only thing that has stopped them grinding inexorably skywards is erosion, erosion by snow, wind and rain…. The height of mountains around the world are determined by these two opposing forces: uplift and erosion, changing them by fractions of an inch, up or down, each year. And make no mistake, “inches” truly means inches… as imperceptible to time as imperceptible to touch. Take a moment to consider the store-bought globe that one might find at any local store or a teacher’s desk; it features geography that undulates by fractions of an inch, and whose mountain ranges are easily perceptible by running one’s fingers over the surface. But in reality these features are grossly exaggerated. As astrophysicist Neil DeGrasse Tyson has observed, if the earth were accurately scaled down to the scale of any store-bought globe all those undulations of the earth would effectively disappear within the dermal ridges of the fingerprint of any individual. In short, the 29,000 ft. elevation of Mt. Everest and the -36,000 ft. depression of the Marianas Trench would amount to less than a ridge of your fingerprint. The 250+ people who have died ascending Everest have died in the space less than we could even notice with a single touch. This is the environment in which we fragile creatures live and die. Ever leave the house in mismatched clothes? Vertical stripes clashing with horizontal stripes? The world feels your pain. Even before the age of the earth was known, strange clues were hiding in plain sight that the world was a deeply old place, and these bizarre displays in rock are known as geological unconformities. Rock, the face of geology and what we think of as permanence — the countless layers of strata laid down over countless millions of years — can be upended by the plate tectonics of the earth, turned sideways, and simply re-purposed as foundation for an entirely new accumulation of layers of rock. This [vertical] layer of rock… formed horizontally, by layer after layer of sediment. Then the whole thing rose to the surface, was flipped by 90 degrees and sank to the bottom of the seas again. There, another layer formed, until finally the whole thing rose to the surface once again. Or consider for a moment the footprints of dinosaurs at Cal Orcko in Bolivia. A 300 foot sheer wall that was once the shoreline of a freshwater lake, its fossilized footprints of giant sauropods are a snapshot captured in time now flipped upright almost as though the ground has hinges… either that or titanosaurs had an impressive talent for vertical rock climbing. The power of the planet can take a lake shore and flip it into a cliff face. Strings of islands [moved] up from the Pacific, smacking into North America over millions of years. These traveling land masses radically reshaped our Pacific coastline…. It was a titanic geological logjam that grafted thousands of miles of new coastline onto our continent, and still had enough power to push up the spectacular coastal mountain ranges of Alaska and British Columbia. The earth is dynamic and restless, ceaseless and ever-shifting, though humans may be excused for not seeing it… in terms of deep time the human lifespan is the length a camera click — as such, we never see more than one frame of an otherwise fluid process. We see a screen grab and can’t comprehend that it’s a movie; it is difficult to appreciate any dynamic quality of something fluid by just one picture. The ball is in mid-air and the skater is in the midst of a triple-lutz; we just lack the wherewithal or lifespan to comprehend the motion. Take waterfalls. We see waterfalls as stationary in the landscape, but even they’re constantly on the move, recessing backward, forever carving out the terrain in reverse. If you find the Grand Canyon impressive today just imagine what it might have looked like 5 million years ago, as plate tectonics lifted the Colorado Plateau, aggressively emptying out an inland sea that was the size of Lake Michigan. What might this have looked like? Well, imagine Niagara Falls… now imagine dozens of Niagara Falls, all recessing for millions of years and carving out the terrain we’re familiar and left with today. Sure, the Grand Canyon is awesome today, but the truth is we missed all the excitement. 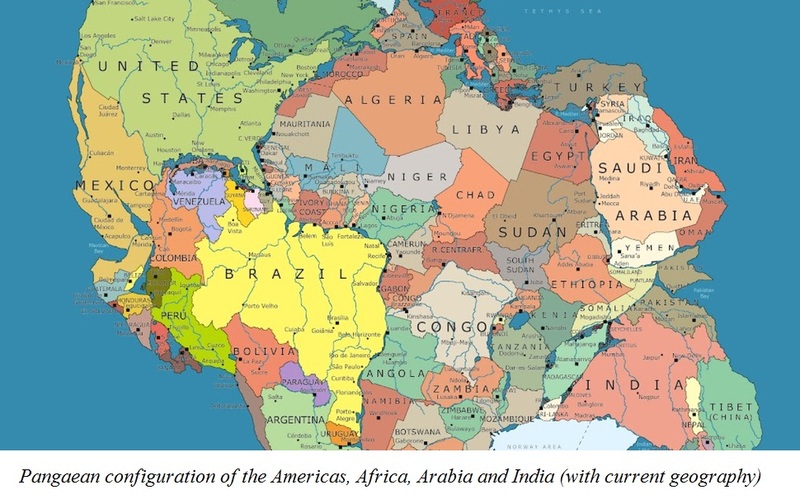 Even the continents that we call “North America” and “South America” didn’t even touch until 3 million years ago…. We find permanence in features that in geological time happened a couple of seconds ago. The world around us is in constant motion, but at a scale we cannot comprehend and at a rate that makes the growth of even the largest tree seem downright manic. An unintended consequence of plate tectonics is realization that there probably was no Atlantis, outside of Plato’s imagination. I believed in the existence of Atlantis in my youth, but the simple fact is that the timetable that would be in question (12,000 years, give or take) only represents about a thousand feet of movement in terms of plate tectonics, not quite enough space for even a peninsula (much less an island or continent) to arise or sink between Europe, North America OR the Mediterranean in that amount of time, and really at this point pretty much all of the continental drift over the past 300 MILLION YEARS can be easily reconstructed and accounted for. Our entire existence as a species is so brief that it only accounts for about 3 miles of plate tectonic movement (200,000+ years averages to 16,667 feet, or 3.1 miles of drift). Today the closest distance from North America to Europe is 2100 miles; so our 3 miles of 2100 accounts for only 0.15% of the distance. Sure, there have been ice ages that have impacted our species in the past several tens of thousands of years — the most recent of which created land bridges across various landmasses and accommodated the spread of our species — but PLATE TECTONICS plays out on a scale of not tens of thousands of years but tens of millions, a scale so gradual that it has never once had a chance to impact our species, and in fact went completely unnoticed by humans before our technology developed to observe it in the 1940s. Alfred Wegener was a meteorologist who first proposed the idea of “continental drift” in 1912. Intrigued by the appearance of matching continental coastlines, Wegener suggested a correlation between the gradual movement of icebergs and and continents, only to find an “icy” reception by geologists. But much like Darwin proposing evolution a century before the discovery of DNA, Wegener’s idea was generally correct even if he could not fathom the mechanics behind the process. In the mid-20th century the world’s sea floors were mapped, uncovering volcanic ridges and rifts that formed stitched outlines spanning the globe. The entire surface of the earth was revealed to be a patchwork of tectonic plates — eight major plates and several smaller ones. These plates are forever on the move, not unlike conveyor belts or escalators forever on the move, with one end continually subducting at its boundary and new crust emerging from the other end, and all averaging at the speed at which fingernails grow. Europe and North America continue to pull apart at the rate of about an inch a year. The average human lifespan will see the two continents moving apart roughly 6 feet. Today, if I were to drive a few miles to the east I’d find the beach there, as I would yesterday, and the day before that, and even last year, or the day I moved here in 1989. But as imperceptible as it would seem in 1989, that beach was one to two feet closer to the African continent than it is today. Multiply the inches by millenia and 250 million years ago, instead of the familiar beach I would have found Senegal there, along with the entire expanse of Africa. The Atlantic Ocean was born 200 million years ago, before then I could have walked from my house to West Africa in a single afternoon. Or turning north I could have gone to hike the Appalachians, which then at their peak would have been stunningly tall and volatile… truly, not unlike an Argentine mistress. Nor was Pangaea the starting point. An inch a year may be a slow process, but the earth is truly ancient; at 4.56 billion years this rate of movement equates to some 72,000 miles, a distance that would circle the globe nearly three times. That would equal a cross-country trip across the United States 25 times over. Driving a car at 60 miles per hour, it would take 50 days to cover this distance without stopping. It’s just under one third of the distance to the moon, but here’s the rub: the moon itself is moving away from the earth at an average of one inch a year, so at the rate of continental drift you’d never catch it! There were probably no fewer than five super-continent arrangements over the course of the earth’s history, Pangaea being just the most recent. Rodinia is the name given to the super-continent predating Pangaea (circa 1.2 billion years to 750 million years ago), and Columbia (also referred to as Nuna) the super-continent before Rodinia (circa 1.8 to 1.5 billion years ago), with each preceding continental arrangement less clear to us and more speculative than the next, until the very earliest arrangements fade into complete speculation. Importantly, Pangaea was the only supercontinent in history recent enough that it would have seen life on land. Pangaea was green, it saw dinosaurs, it saw life before dinosaurs, it saw almost the entirety of vertebrate history out of the water. Rodinia and all previous arrangements predated complex life and an ozone layer; as such these previous supercontinents were featureless cratons, lifeless landscapes baking in an atmosphere of ultraviolet radiation. Sadly, Wegener didn’t live long enough to see his theory vindicated. In 1930 he went on an expedition to Greenland. There, in temperatures of minus sixty he died of cold and exhaustion. He was buried on the ice. Because of continental drift, his body is now two meters further away from home.